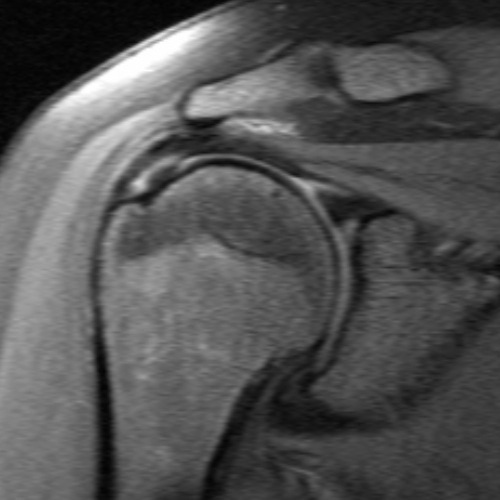 Normal Rotator Cuff tendon (supraspinatus), seen on ultrasound. The rotator cuff is an important group of muscles and tendons that help keep the arm in the socket. The also help raise and turn the arm in space. A tear in the rotator cuff weakens the shoulder, which may mean difficulty in daily activities like combing your hair, getting dressed, or performing what used to be simple tasks. The rotator cuff consists for four muscle-tendon units. Tears usually affect the top tendon (the supraspinatus). It may also involve or propagate to involve the back (the infraspinatous) or the front (subscapularis) tendons. Tears may progress over time, as pain and loss of function get worse gradually. The patient asks for help when he/she cannot cope anymore. In some cases, however, an injury or a fall may cause an acute rotator cuff tear. The rest of this discussion refers to more common established (chronic) tears of the cuff. Torn cuff tendons typically start by fraying. As such, a tear may be Partial or Full-Thickness. Once torn, the tear frequently progresses and the tear may get bigger. With time, the tendon edge may pull further and further, making it harder or even impossible to repair. At the same time, the longer the tendon is torn, the higher the chance the muscle loses substance (fatty degeneration), making full recovery likely even with a successful surgical repair. The most common symptoms of a rotator cuff tear include pain at rest and at night, and pain when lifting and lowering your arm. The arm may be weak, and you may experience grinding and crackling. Physical examination focuses determining the source of pain, evalaute mobility, and most importantly, finding out how much weakness there is in the arm. Rotator cuff bursitis frequently comes with pain and loss of mobility. Weakness is usually not a major element. When present, weakness is a red flag that triggers me to actively look for a tear using an advanced imaging modality such as an ultrasound examination or an MRI. I frequently start with an ultrasound examination because it is reliable, can be done during the same visit, and can save the patient a trip to the MRI machine. The mere presence of a tear in the rotator cuff not does mean that surgery is necessary. One has to factor in several points to reach a decision: pain; weakness; and functional demands. The patient has also to be able to commit to the post-operative restrictions and recovery protocol. The surgery itself on only the first step, and the rest depends on the patient to achieve the goal of the surgery. Following a cuff repair, we have to protect it until it is healed, which means the patient has to respect his restrictions until instructed otherwise. Physical therapy is very important. During the first phase, therapy helps maintain motion without stressing the repaired tendon. After the protection phase has passed, therapy aims at retraining the cuff muscles to return to function and regain strength. For some patients, surgery may not be the best option if they cannot commit to the restrictions or they have little demands that going through the recovery period may not be worth it.